Wow! 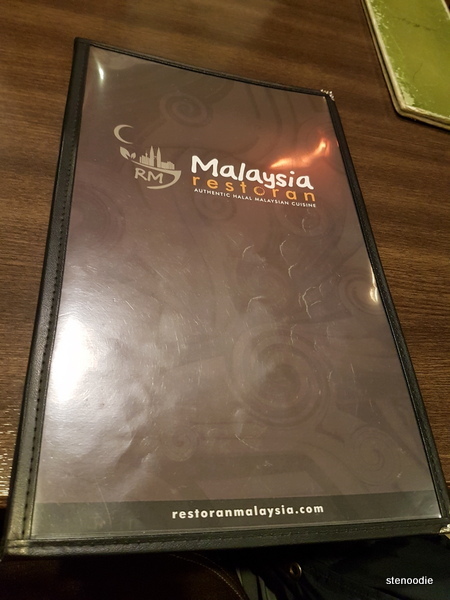 I was so impressed with Restoran Malaysia! 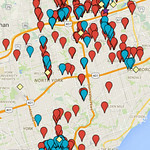 I had been eyeing this restaurant for a while now seeing that it was the restaurant in second place on Urbanspoon in the Richmond Hill neighbourhood. It just so happened that I was looking at the daily e-mail that Groupon sends me, and the top deal of the day was for Restoran Malaysia. I thought to myself, “Hey! 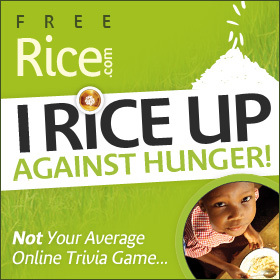 I want to go to this restaurant and there’s a deal for $40 worth of food for just under $30! How perfect.” And within minutes, the Groupon was tucked into my hands. 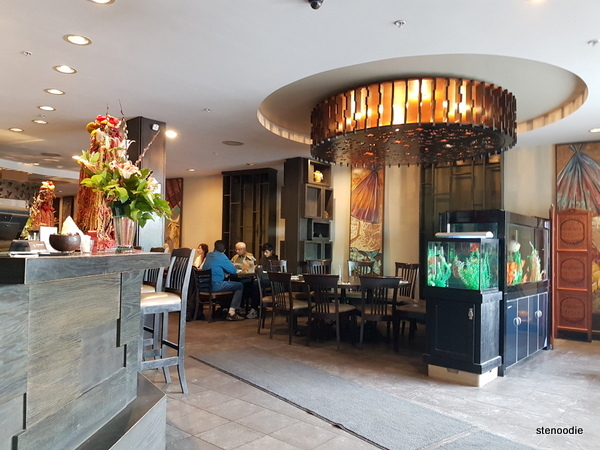 I walked with my mom into the restaurant at around 3 p.m. in the afternoon on a weekday thinking that it would be quite empty since not a lot of people eat lunch at this time. Surprisingly, there were two other tables still eating and during our stay, there were three more tables that filled up. It showed me that this place was popular even during the quietest time spans of the day. This place must be good! The curry mutton was delicious! 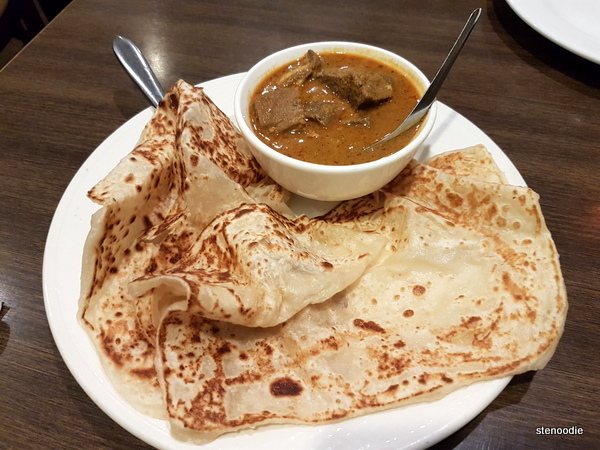 The homemade roti canai and curry mutton was absolutely amazing. I couldn’t believe how soft and well-made the roti was. You always have to eat roti when it’s steaming hot and fresh, and the roti here sure didn’t disappoint! The curry mutton was also amazing. It came in a little bowl and had more than enough curry for you to dip the roti into. Inside of the bowl were a good number of mutton. Both the curry and mutton were impeccable. The curry wasn’t too spicy, but spicy enough to make you want to eat more. It was just so perfectly made. I don’t think I even had such good curry when I was in Malaysia! And that’s speaking a lot! 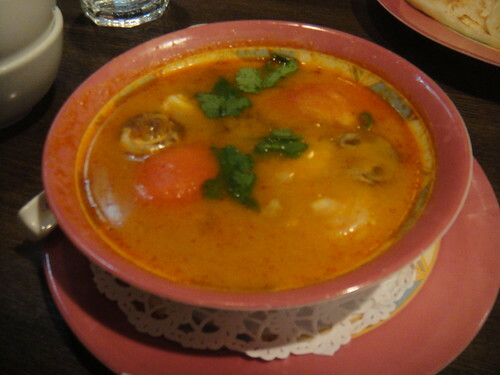 Next, the Tom Yam Seafood Soup arrived. We were first thinking of getting the Tom Yam Soup, but then decided to try the seafood version since it was only $1.50 more than the regular one. The Tom Yam flavour of the soup was pretty good. You could tell that it was made with real ingredients and not MSG since the spices and lemon grass were scattered throughout the small bowl. What I liked the most about the soup was the huge crispy and fresh shrimp that was in the bowl. It was super crisp when I bit into it. Otherwise, although the soup itself was pretty good, it wasn’t a 5 star quality. 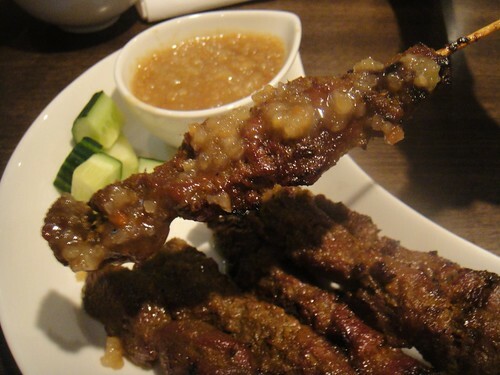 The skewer of Satay Beef Tenderloin was incredible! 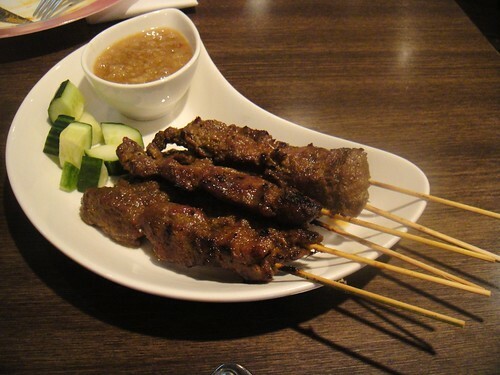 There were 6 skewers of beef tenderloin and you could dip it into the peanut sauce that was provided on the side. The beef tenderloin was incredibly soft and so well flavoured. It smelled amazing and you could taste the herbs that covered the beef tenderloin. We were both very impressed with how tender and soft the meat was. It’s really hard to grill beef to a tender perfection. I liked how there were small cucumber cubes on the side as well. The peanut sauce was well-made even though I’m not a huge fan of peanuts. I found that the sauce complimented the beef tenderloin well. The most tender beef skewers I’ve had! 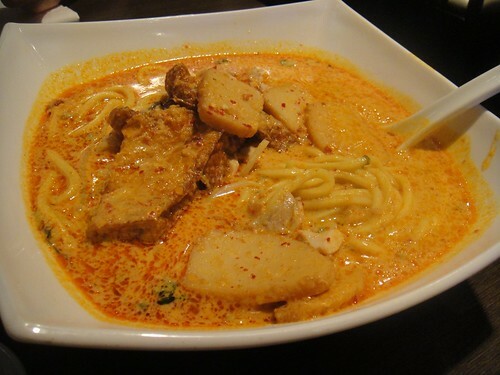 The Singapore Laksa was also very impressive. It arrived in a wide square bowl and the soup base was SO rich! I had a couple spoonfuls of it even though it made me quite thirsty later and not only did it smell so good but it also had a really rich creamy taste to it. Surprisingly, the laksa soup base wasn’t spicy. 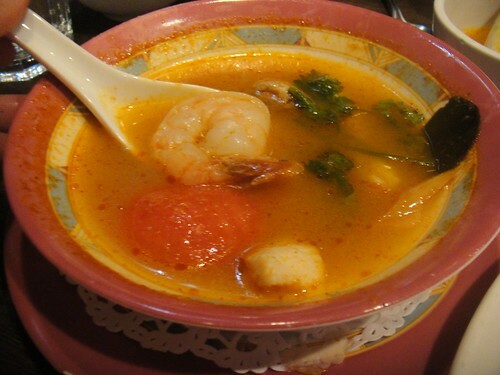 Or maybe because we had had the spicy curry mutton and Tom Yam soup first that the laksa didn’t taste spicy to us. I found the noodles to be a mix between spaghetti noodles and udon. Either way, they were really good and went well with the soup base. The tofu pieces were large and tasted good even though its appearance gives you the appearance of a pork chop. The fish cakes were plentiful and very soft and tasted great. What I loved about this dish was the amazingly soft and smooth chicken strips that were hidden within the noodles. I was very surprised with how good the chicken was. Usually, with noodles like this, the chicken may be overcooked and taste super rough and unflavoured. I couldn’t get enough of the chicken strips — it tasted amazing! January 20, 2018: Wow, I returned back to this restaurant five years later with my boo! On this Saturday, we arrived at 1:30 p.m. and surprisingly still had to wait about five minutes in the foyer before we received a table to sit at. This restaurant was busy right up until we left at 3:30 p.m. 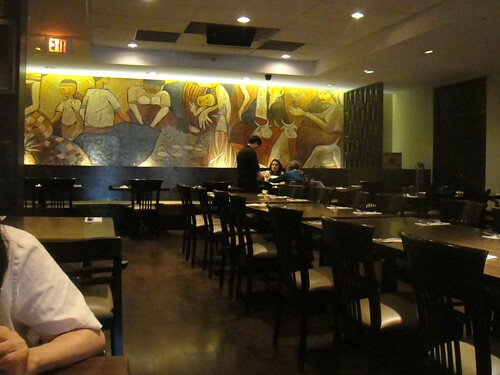 I was surprised that there were people still dining in for lunch at 3:30 p.m. in the afternoon! We ordered three items to share and it just so happened that I already had ordered the same two items on my first visit too! XD My tastes haven’t changed it seems. 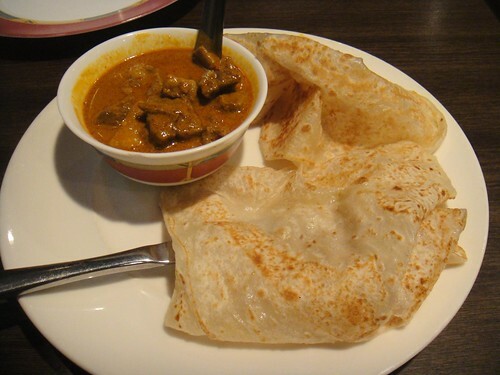 The Roti came in two pieces with the Curry Mutton. What has changed though is their price. It used to cost $10 five years ago and currently at the time of writing in January 2018 costs $13 for this dish. The portion was the same. 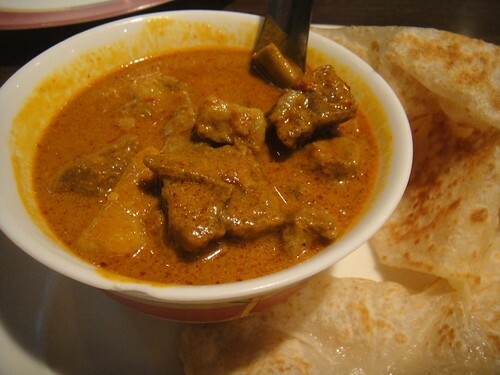 The curry mutton was just as good — not too spicy with some heat and the mutton was very tender and firm. Yummy. The roti was good too and light. 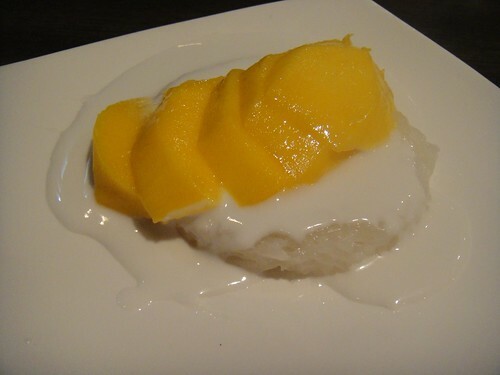 Don’t leave it on the plate too long though otherwise it becomes cold and too chewy. We ordered the Mixed Beef and Chicken Skewers. This came with house made peanut sauce and cucumber cubes. I liked the tender chicken. 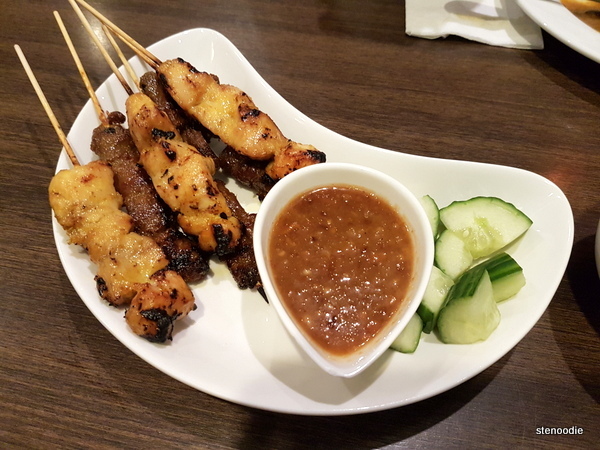 We found that the peanut sauce and the meat were quite sweet. After a while, I wasn’t a huge fan of their sweet marinade that they had put on top of the meats. I’d rather it have been a salty glaze instead. It was still good in terms of the meat because very tender. 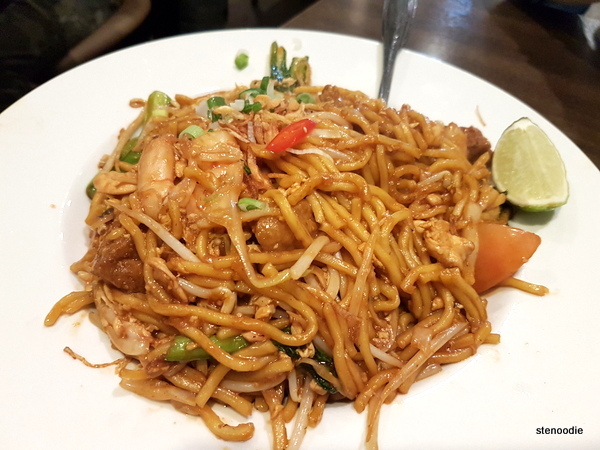 The Mee Goring was a noodle dish with miki noodle, shrimp, chicken, beansprout, tomato, tofu, choy sum (green vegetables), and lime. I found that there wasn’t a lot of chicken in this. Everything else was visible in the dish. It was a pretty good stir fried noodle dish. The portion was quite large too! At the time of writing, they only accepted cash though. 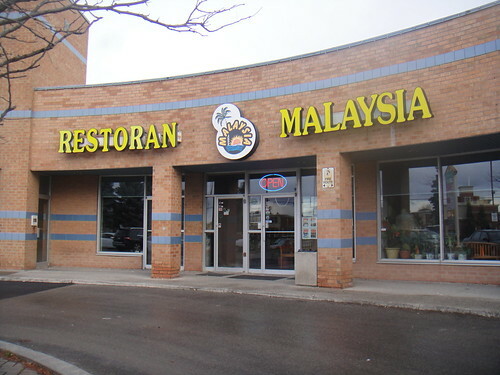 This entry was posted in Food and tagged 815 Major Mackenzie Dr E, beef tenderloin satay skewers, food blog, foodie, Groupon, Halal, Malaysian cuisine, Malaysian food, mango rice pudding, Mee Goring, Mixed Beef and Chicken Skewers, restaurant review, Restoran Malaysia, Restoran Malaysia reviews, Richmond Hill, roti and curry mutton, roti canai and curry mutton, Satay Beef Tenderloin, Singapore laksa, Tom Yam seafood soup, Vegetarian. Bookmark the permalink.